Over the last two weeks the Doc ‘n’ Roll festival has been screening independent DIY film premieres across London, brought to us by BFI, the screenings take place each year and tour around the country with Director Q&A’s to follow. We went to watch Never Stop!! Directed by the French film-maker Jacqueline Caux, a Parisian who discovered techno and many of the instigators of the techno scene at late night parties in Paris, what better person to share her insights into this ‘music of resistance’. The film takes us through the story of the fascinating Belleville Three, depicting how a scene emerged with interviews from Juan Atkins, Derrick May and then later Jeff Mills. Set against the landscape of Detroit, a techno anarchy emerges against a backdrop of incredible architecture, broken and degenerated, a skeleton of a city, thriving with creativity at the heart, this hub of prosperity abandoned by the American dream. 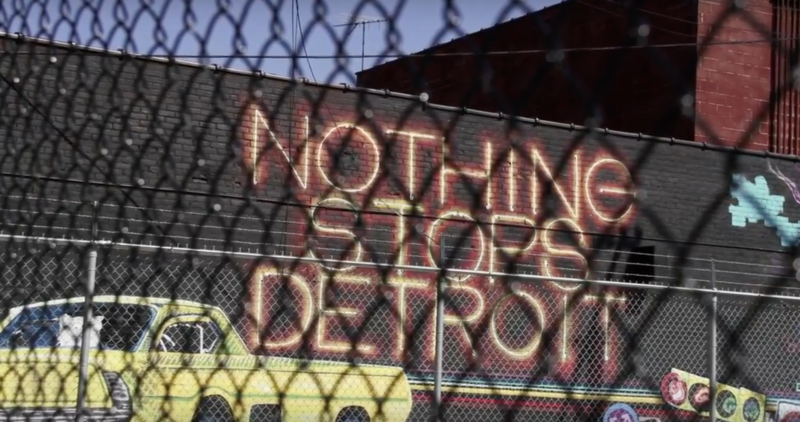 Engaging from the start, graffiti fills the screen, ‘Nothing Stops Detroit’, capturing the excitement, creativity and growth of the time. A narration from The Mental Machine by The Electrifying Mojo, follows, “some people setting up roadblocks, others getting out of the way, other people removing roadblocks”, a lady walks across a desolate and spacious crossing in the middle of a town many would escape from and yet so many survived and created the foundations of one of the most exciting musical movements. DJ Mojo had a big impact on the sound of Detroit, a futuristic sound that escaped the desolate broken landscapes with sparser sounds, noises and progression in sound design, a new style with a smooth glowing elegance. Electrifying Mojo was essential to the proliferation of techno music, being the first DJ to start playing the long mixes by the Belleville Three, from Cybertron to the groundbreaking Model 500 track, No UFO’s. Detroit was the perfect city to start a musical movement, a place where you could get everything you needed from mixing, production, distribution – quickly the sound moved from record shops in Detroit to Cleveland and then Chicago. Turning up to gigs with cardboard boxes filled with records, keyboards, Moog and Korg synthesizers, they spent hours in their bedrooms programming their own sounds and transporting the full kit to the dancefloor. The film captures a spirit of creativity and expression, to define and explore their existential selves, away from corporate capitalist America and the major labels. Juan Atkins suggests a scene that was eventually eroded by the CD, a format that dampened the spirit of the indies. He muses that without the CD, perhaps the quality of vinyl would have won out over the free download. Alongside the sensitively filmed, slow-moving scenes and a brilliant soundtrack, the film accompanies compelling archive footage of Jeff Mills DJing at Heaven, to crazy dance moves, a revolution in expression. This phenomenal movement within the dance world, exploded across dance floors worldwide, without much media coverage. Along with a new freedom, came new sounds and experimentation, Jeff Mills shares his influences from American Gigolo, to Laruen Mars, clubbing from a young age, this was his whole life in sound, that diverged into different labels from Purposemaker to Axis, as he brought new symbolism, concepts and ideas into the sound and design. The great thing about DIY films is the organic and homegrown feel, you get the feeling of stories, untainted, as they are told from the chosen storyrelling viewpoint of each director. There is a sense of excitement and honesty, often told through the eyes of interviewees and major players. The Doc ’n’ Roll festival features tales of the greatest breakthroughs and struggles that have defined cultural scenes. Screenings this year depict stories from Trojan Records, to explorations of grindcore, a film on the Mercury music winner Badly Drawn Boy, to Ella Fitzgerald – a snapshot on her voice. The festival tours to different cities around the UK each year and it is well worth digging-out and unearthing some of these home-grown treasures. You can still catch the Trojan Records Documentary ‘Rudeboy’ at screenings across the country, following their Jury Prize award and look out for the festival as it continues into 2019 and already open for submissions.